The share of cocaine containing fentanyl appears to have risen sharply in recent months, reversing a sharp drop in fentanyl-laced cocaine and threatening to cause a new round of overdoses in a population not expecting fentanyl. Of cocaine seized by law enforcement in the last two months of 2018, fentanyl was found in cocaine 11.7% of the time in November and 11.1% in December. That’s a worrisome danger sign that a high level of opioid overdose risk may have returned to Ohio’s cocaine supply. Fentanyl-laced cocaine had dropped to 6.3% in August, far from the peak of 15.4% in April 2017, a time when cocaine-fentanyl deaths outnumbered heroin-fentanyl deaths. The good news was that none of the cocaine tested for November or December contained carfentanil, an ultra-potent (and deadly) fentanyl analog. 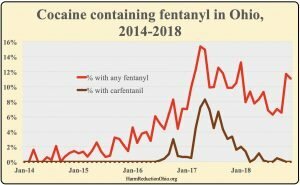 Carfentanil caused Ohio’s overdose rate to reach No. 2 in the nation and has killed about 2,000 people since it came to Ohio in early 2016. Of the 4,467 cocaine samples seized since March and tested at the state crime labs, only 13 (or 0.29%) had carfentanil in the cocaine. Thats a far cry from carfentanil being in 8.3% of the cocaine supply in May 2017. 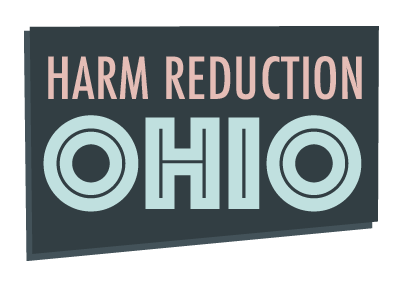 The Ohio Bureau of Criminal Investigation supplies Harm Reduction Ohio with quarterly data on all drug tests done at the four state crime labs. The results of about 35,000 gas chromatography-mass spectrometry lab tests — derived from drugs confiscated from users by law enforcement in all 88 Ohio counties — is the most comprehensive and accurate information on the composition of the illegal drug supply in private hands. The results provide a large and geographically diverse (but unscientific) sampling of Ohio’s cocaine supply. So far, half the cocaine seized in November and December has been processed, so the numbers may change somewhat when the data is updated again, on March 30. 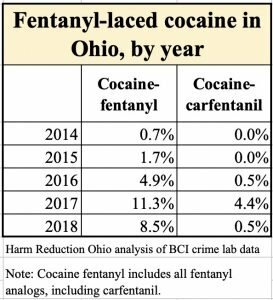 But these unexpectedly high levels of fentanyl-laced cocaine show the trend to less fentanyl contamination in cocaine has stopped. Cocaine users — many who lack tolerance to opioids — should consider themselves at serious risk of an opioid overdose. Always have the opioid overdose-reversing drug naloxone nearby. Be aware themselves — and make sure friends are aware — of the signs of overdose. Consider using fentanyl test strips to test their cocaine.